For today’s deals roundup, we’ve found some deals on Paytm Mall on power banks, which can be bought for less than Rs 1000. If you've run out of smartphone battery often and are looking for a portable charger to carry around then you came to the right place. The list contains power banks from brands like Micromax, Karbonn, Ambrane and more. All deals are under Rs 1000 after including the cashback on Paytm Mall. The Ambrane P-112 10000mAh power bank comes with three USB ports, which can charge up to three smart devices simultaneously. The power bank is equipped with a LED indicator that lets you know the power left in it. Ambrane also added a torchlight that can be rotated by 180 degrees. You can purchase this device here. The Intex IT-PBA 10K Poly 10000mAh Power Bank is protected from short-circuits, overcharge and over-discharge. The power bank sports two USB ports and can charge up to two devices at the same time. You can purchase this device here. The Powerocks P1005A 1000 mAh Power Bank sports two USB ports and lets you charge up to two devices simultaneously. It also features an LED display that keeps informs you about charge left in the device. The product is available on Paytm Mall with a hefty 60 percent discount along with a cashback. You can purchase this device here. The Micromax power banks are BIS certified, which helps if you are looking for a degree of quality with your power banks. It comes with a LED indicator that keeps you aware of the power level of the device. It is equipped with two USB ports and can charge up to two devices at the same time. You can purchase this device here. 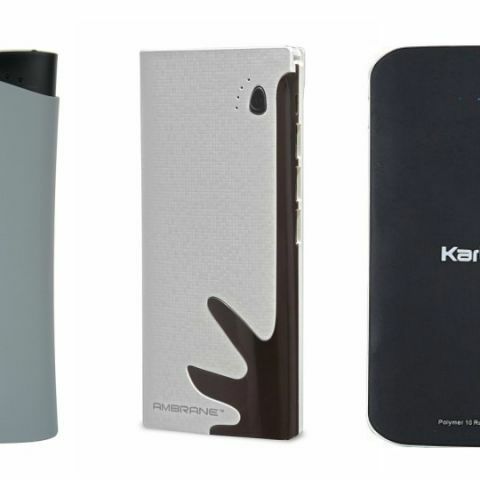 The Karbonn Polymer 10000mAh power bank has two USB ports that can charge up to two smart devices at once. The company has also equipped a LED indicator at the front that informs the user about the charge left in the device. It should be noted that the Karbonn is providing six months warranty to the users, that does not include physical damage. You can purchase this device here. The Videocon claims that the 10000mAh Power Bank has a 2.1 fast charging system, which should charge your smartphone faster. It also comes with an intelligent power management system, which allows you to keep an eye on power level, estimated charging time and discharge time. You can purchase this device here. The Intex-PB11K 11000mAh power bank comes with two USB ports that can charge up to two devices at once. The device also features a LED indicator and LED flashlight. It is available in two colors white and black. You can purchase this device here. The Ambrane P-1250 is a compact device, which the company claims can charge your smartphone up to multiple times in one go. The power bank is also protected from overcharge, over discharge and short circuits. You can purchase this device here.